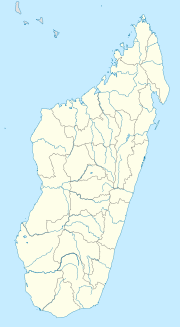 Antanandava is a town and commune (Malagasy: kaominina) in Madagascar. It belongs to the district of Ambatondrazaka, which is a part of Alaotra-Mangoro Region. The population of the commune was estimated to be approximately 8,000 in 2001 commune census. Only primary schooling is available. The majority 85% of the population of the commune are farmers, while an additional 4% receives their livelihood from raising livestock. The most important crops are rice and peanuts; also maize is an important agricultural product. Services provide employment for 1% of the population. Additionally fishing employs 10% of the population. Situated close to the commune is the Zahamena National Park. ^ a b c "ILO census data". Cornell University. 2002. Retrieved 2008-03-06. This Alaotra-Mangoro location article is a stub. You can help Wikipedia by expanding it. This page was last edited on 11 March 2017, at 21:43 (UTC).